DUE TO THE SHIPPING RESTRICTION, YOUR PACKAGE DOES NOT INCLUDE LUBRICATING OIL. -4 replaced combs(3mm,6mm,9mm,12mm) meets all your trimming needs no matter soft and supple or rough and bristly fur. -Powerful gear and super quiet operation made your pet frighted no more. -Full equipped kits, meet all your pets care requirements. -Copper spindle and ceramic blade never get rusty and overheated, avoid hurting the pet hair and skin. -Reduce load of external parasites on skin. Make your pet clean and pretty. -No more expensive bills for pet grooming and you can do it by your own in an easy way, build a intimate interaction with your pet. -You can charge the built-in battery before use and apply to cordless mode, or you can plug in power if you forget charging. 1. Due to the shipping restrictions, your package does not include lubricating oil. 2. If your pet have long and thick hair, like German shepherds, Havana, Himalayan, Yorkie, you need to use scissors (included) cut part of them at first, otherwise the clippers will jam up and don't work properly. 3. Do not clean by large amount of water or other corrosive liquid. Keep the product dry after cleaning. 【Universal Utility】: Detachable and adjustable blade suite for all types of coat and pet, no matter for soft and supple or rough and bristly fur, this clipper can satisfy all your clipping needs. Ceramic acute angle blade has 5 adjustable gear position ranging from 0.8mm-2.0mm. 4 replaced combs(3mm,6mm,9mm,12mm) make it easier and safer to operate even for new user. 【Powerful and Super Quiet】: Powerful gear with stable and steady control. Low vibration and ultra quiet operation, make the pets panic and escape no more. Powerful and quiet motor of professional pet clippers with copper spindle avoid hurting the pet hair and skin. 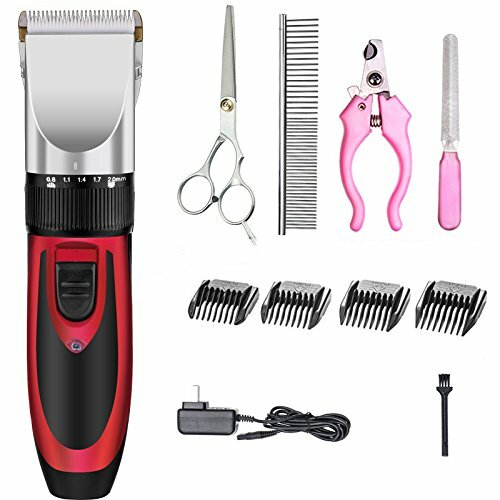 【Fully Functional Kits】: This pet clippers kits include: 1 × Pet clipper,1 × AC Power Adapter,1 × Cleaning Brush,4 × Comb Attachments(3-6-9-12mm),1 × Stainless Steel Scissors,1 × Stainless Steel Comb,1 × Nail Clipper Kit,1 × Nail File, meet all your pets care requirements. 【Dual Mode--Rechargable Battery or Plug in】: The clipper has a built-in rechargeable battery, you can apply to both wireless or plug in use. A fully charged battery can provide about 60 minutes service time. 【After-sales Warranty】:We are willing to refund if you would like to sales return within 30-days, please contact us freely if you have any problem about our products. If you have any questions about this product by SIYUE, contact us by completing and submitting the form below. If you are looking for a specif part number, please include it with your message.